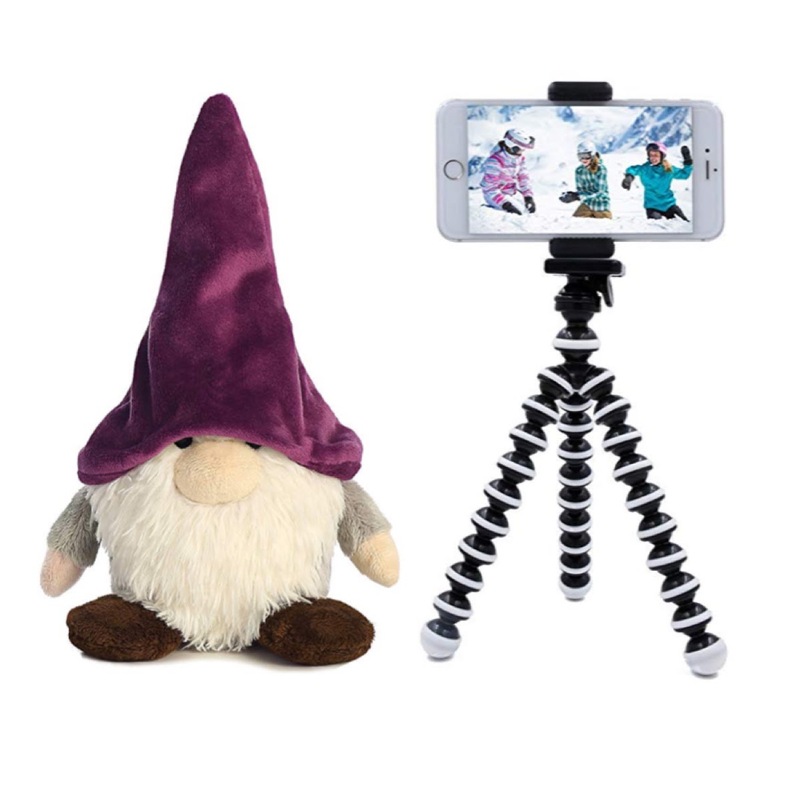 The first recorded act of ‘gnoming’ (the act of stealing a garden gnome, photographing it around the world, and returning it with photos) happened in Sydney, Australia, in the 1980s. When the story made the news, the prank gained popularity. In 2001, the French film Amelie also made reference to the prank. 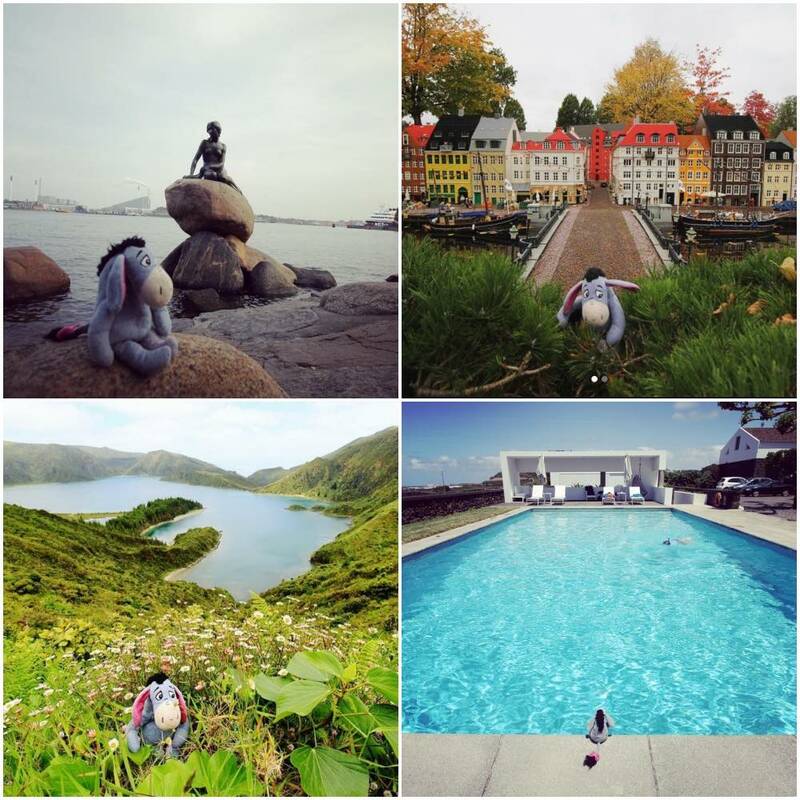 It was also the inspiration behind the ‘Roaming Gnome’ advertising campaign by Travelocity, where their gnome is photographed in different locations around the world. Other lawn ornaments that have since made headlines for being ‘gnomed’ include: Murphy / Barrington, Leopold the travelling gnome and "Gnome" Severson to name a few. This is probably what inspired me, and many others, to do the same, or at least something similar. 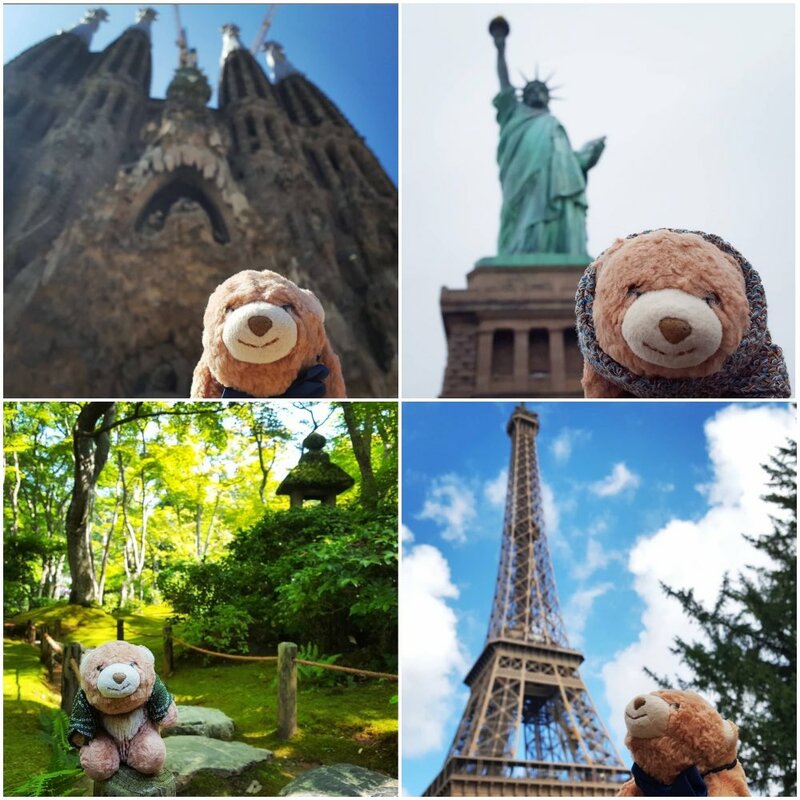 Anyone who is familiar with this blog knows about Rodrigo, my travel mascot. Nine years ago I bought him in the discount section of Target for $2.50 because I always wanted a plastic lawn flamingo and I could never find one in South Africa. (Now, they’re everywhere.) I started taking photos of him because I happened to be working on a cruise ship and it seemed like a good idea at the time. 53 countries later, it’s probably too late to stop now. The practice of adopting a travel mascot (whether they are stolen to not) to photograph them around the world is definitely not that unique. And then, in 2010, Instagram became a thing and a lot of these ‘travel toys’ got their own accounts. So, if you thought you could never be jealous of an inanimate object, below, I have put together a collection of 18 of the most envy-provoking travel mascot Instagram accounts for your perusal, in no particular order. Current city: I'm currently back home in Singapore. Future travel plans: I will be visiting Peru next. Favourite place: My favourite place to visit is Japan, mainly because there is so much to see and do. Each region offers something special: flower fields in Furano, sakura blossoms and elegant temples in Kyoto, fiery autumn leaves and beautiful mountain-scapes in Nikko. And I love Japanese food! Number of countries you’ve visited: I've been to 12 countries (excluding Singapore, where I'm from). Where did your human get you and how long have you been travelling together? My human found me in a pop-up sale in a mall. We have been travelling together for 3 years. We started travelling together because my human wanted to challenge herself to think of new ways to take photographs, and she thought it would be cute to have a small bear interact with the big world. That, and I make her smile! Future travel plans: Heading back to Los Angeles. Favourite place: My favorite place would be Africa. It was an amazing and unforgettable experience. Number of countries you’ve visited? My human has been to more countries but together we’ve been to 17 countries. My human got me about 2 years ago in Taiwan and we have been traveling together since. We had a special connection the moment she got me and I’m a perfect travel size companion. Favourite place: My favorite places are Greenland and Sahara in Lybia. I was there but there is only one bad photo from Greenland. Those were dark times in a bag. My favorite place in the light is Namibia. 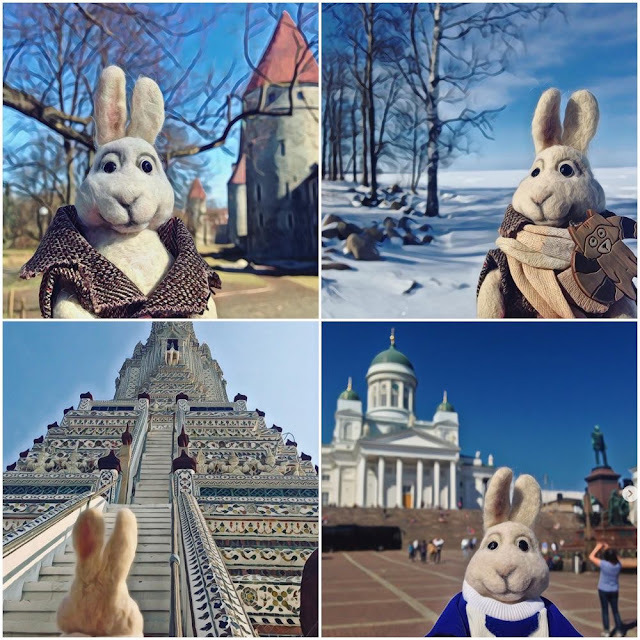 I started traveling with my human right after she found me in a store somewhere in Finland in about 1993. We both don't remember details as it was such a long time ago. At first I was just a good luck charm, and my human didn't take photos of me. But then one of her friends told her about traveling plushies and encouraged her to show me to the world. 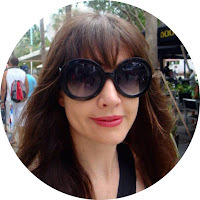 Current city: I'm from Brazil (São Paulo) and I love travel with my family. Future travel plans: Now I'm in Brazil, but last week I visited Miami and the April beginning I'll visit Montego Bay - Jamaica. Favourite place: I visited lots of beautiful places. I visited Egypt and Torres Del Paine (Chile - Palagonia)... and I loved those places so much! My father gave me to my mother when they were dating, and my mom loved me at the first look. My father buy me in a shopping mall story, trying to win the love of my mother. And it worked, because now they are married. I'm 10 years old. I have been traveling with my family all my life. And the choose to travel with me because I'm their son... do you travel without your son? :). I'm part of family! If they travel without me I'll cry a lot. Current city: Currently I am in Germany, in Osnabrück, for the first time. Future travel plans: This year I will travel to Bolzano, Italy, Yokohama, Japan, long beach, USA and Rostock, Germany. Favourite place: My favorite place so far was New Zealand, because I was travelling on the bike and had a good view all the time. Number of countries you’ve visited? Good question: Canada, USA, Mexico, Japan, New Zealand, Australia, Germany, Spain, France, Great Britain, Vietnam, Malaysia, Sweden, Portugal, Turkey, Bali, Switzerland, United Arab Emirates, if I have not forgotten a few. Yes, I forgot a few: Denmark, Argentina, Uruguay, Singapore, Brazil, Thailand, Czech Republic, Netherlands. Actually, I am travelling for a long time with my human (:D), since 2005, but the first pictures were taken in 2007. The first picture was in winter on our way to Niagara falls in Canada, while we were trying to navigate through a blizzard. 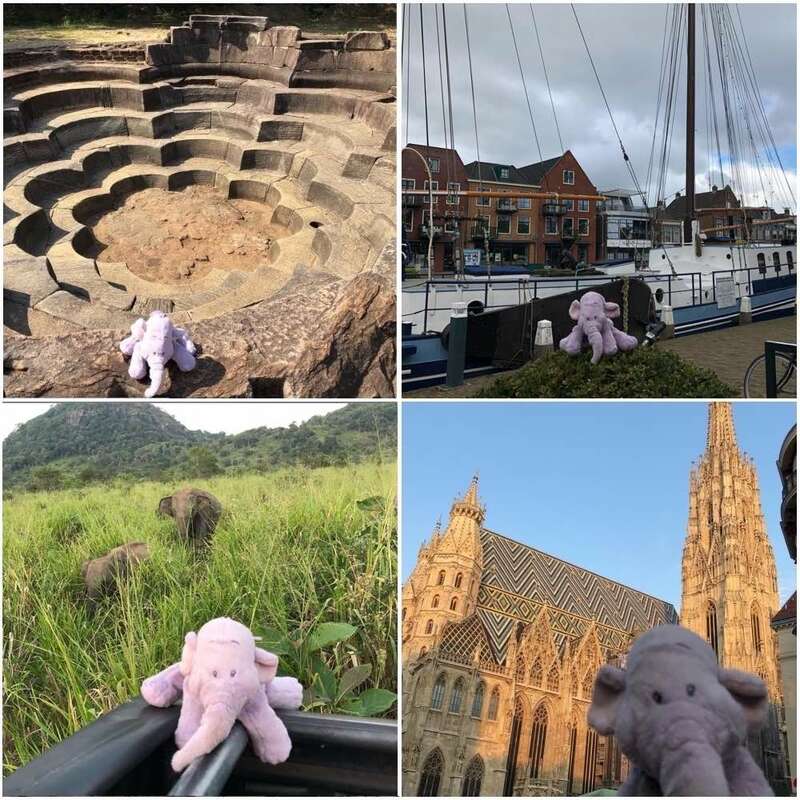 Maybe elephants are good in navigating, so far I never got lost (not at least) and always find back home. I was a present from a really good friend. Future travel plans: Later in the year, fingers crossed we’re off to Hayman Island in The Whitsundays which is off The Great Barrier Reef in Australia. Number of countries you’ve visited? I’ve been to about 26 different countries and over 50 different cities. Almost as old as the Roaming Gnome prank is this travel mascot. This 'teddy cat' has been travelling with her ‘human pets’ for 30+ years. They may have invented the travel toy. Current city: I'm currently lounging in my basket at home. Future travel plans: No plans for the next travel, but my wish list includes Andalucia, Georgia, and Northern Ireland. Favourite place: Now, that's a real toughie. Ermm, the ones with the chocolate? Oh, that's all of them. Most of my trips involve eating chocolate, but my pets and I once stayed on a cocoa farm in Ecuador, which was yummy. Number of countries you’ve visited? Teddy Cats also have a rather strange counting system that human pets don't really understand, so it's probably around 50, but it could be 500 (although there are only 195 countries in the world, according to Google, and we definitely haven't visited them all. I'd like to, though. My aunty Aru Pet gave me to my pet when she was 8 years old (that's about 200 years ago, now, I think). Both of them share the same birthday. I don't know where I came from originally as I had my eyes tightly shut, and my aunt was working on placements as a doctor in the US, Ireland, and Nigeria around that time, so I've got no idea.) I decided to travel with my pet, because quite frankly, she needs to be supervised at all times. And she likes taking photos, and I like visiting places. Win win. Future travel plans: The next trip will go to Berlin the capital of Germany. Favourite place: I think my favorite place was SriLanka which we visited a few weeks ago. Number of countries you’ve visited? I didn’t count the countries so I really don’t know that. Once I belonged to the daughter of my humans when she was a child. I started traveling with them because the little girl loved me. But there was no Instagram yet. 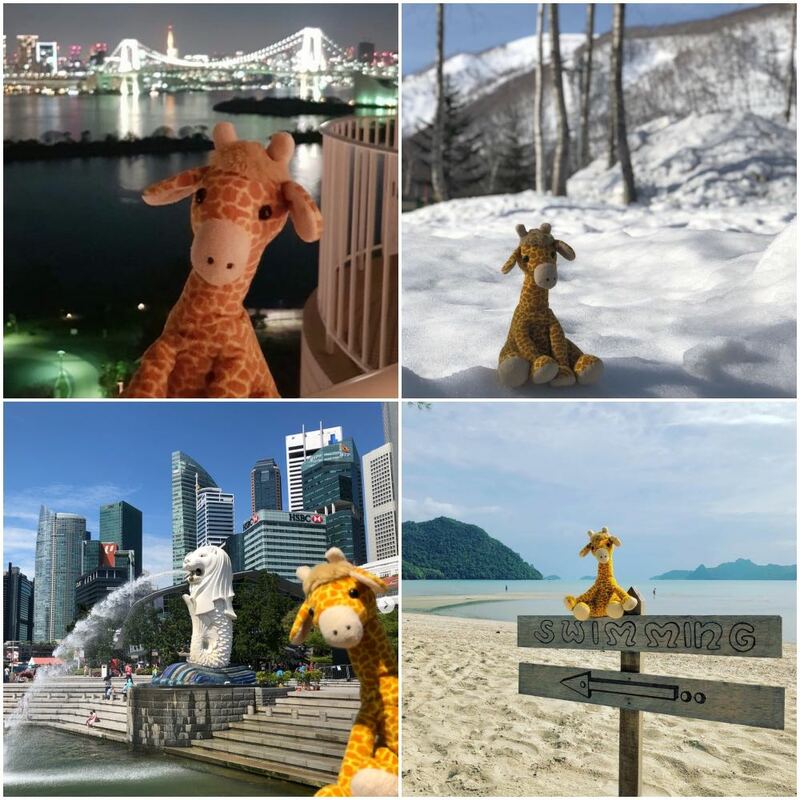 When the daughter get older my humans said that it would be funny to travel with me and to put these pictures on Instagram. 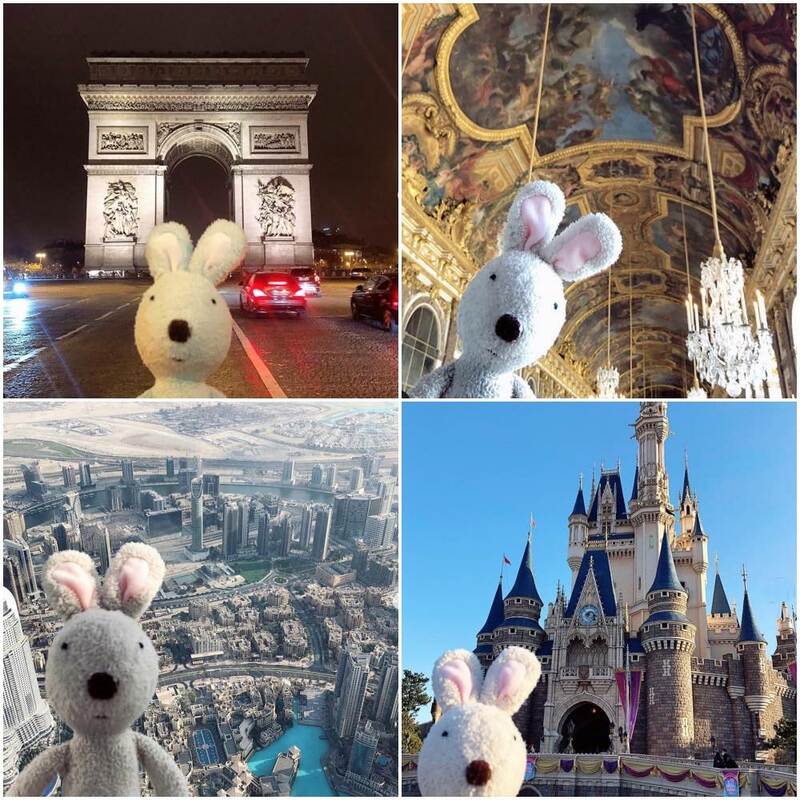 We travel and take pictures together for about two years. Future travel plans: Georgia and Italy. My human make me self - handmade from wool. We together almost 4 years. Current city: I am currently in Las Vegas. Future travel plans: Next, I will embark on a 3-week road trip in Utah, Arizona and New Mexico to visit their most iconic parks. 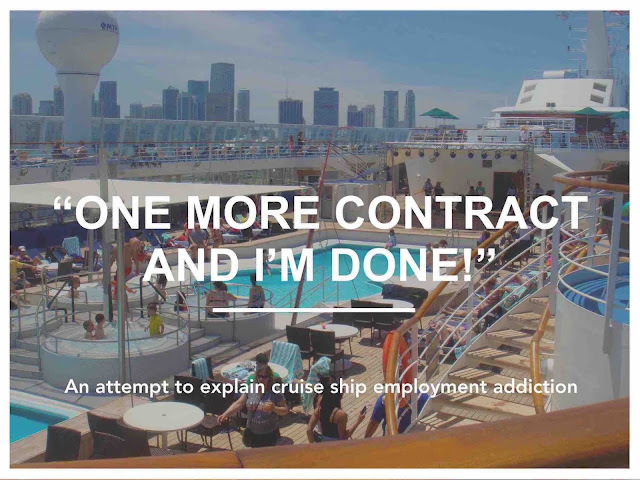 Then I will take a cruise ship across the Atlantic to return to my home base in Europe. Favourite place: This is really, really tough. I will have to say Cocoa Island in the Maldives. I have been there three times and would go back in a heartbeat. Number of countries you’ve visited? I have visited exactly 100 countries and hope to add a few more this year. My assistant (human) chose to travel with me 15 years ago because she was afraid of flying and I told her I could keep planes from crashing if she accompanied me. She believed me, silly woman. Also having seen his fair share of airports is this Eeyore. 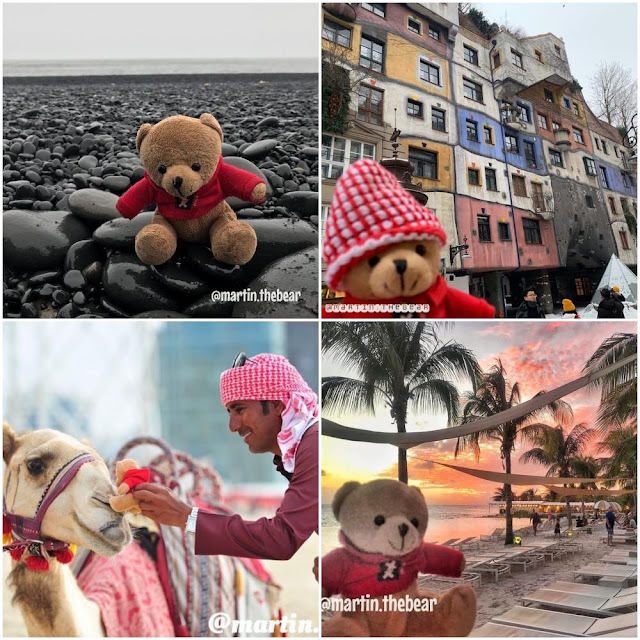 Considering the quality of his photos, and the fact that (at the time of posting this) he has less than 200 followers, he is probably the most underrated travel toy account on Instagram. Current city: Currently I find myself in Germany (our home for now). Future travel plans: Next destinations are undefined for the moment. I was lost at the Chicago airport and got found. And my human takes me since then for the travels. I read a bit more about this Eeyore and it seems he was found in an airport in 2004. Though he has been the travelling companion of the family that found him for 13 years, they are looking for his original owner. I hope they find the original owner and make a Toy Story-like movie about him, but not too soon as this account is spectacular. Number of countries you’ve visited? I think I’ve visited about 35 countries. My assistant found me at Amsterdam airport Schiphol. She just couldn’t resist my smile we’ve been travelling for about 4 years I think. Considering his ‘assistant’ is a pilot, he is definitely the travel toy with the most flyer miles. 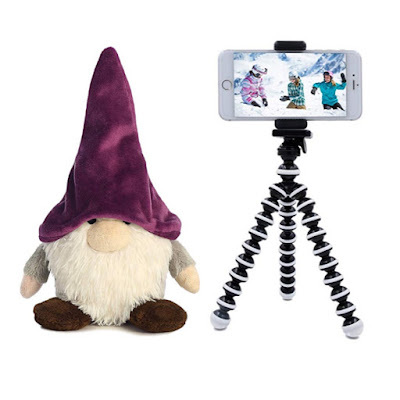 He is practically to KLM what the Roaming Gnome is to Travelocity. 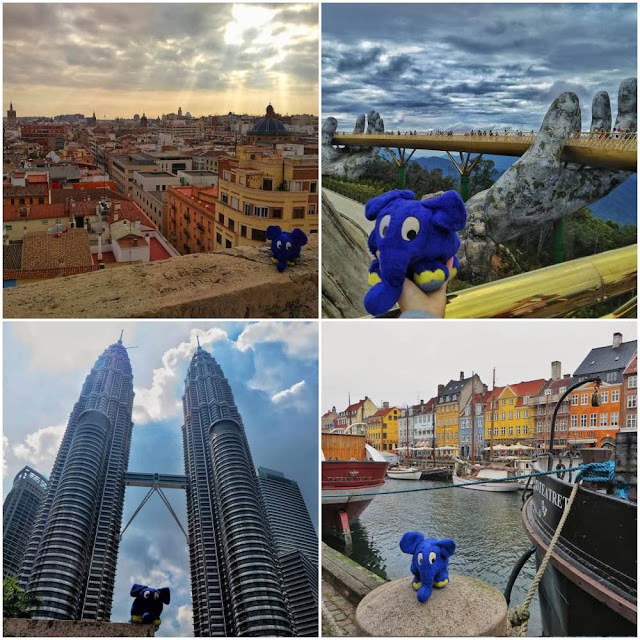 Martin is not the only travel toy who seems to double as a brand ambassador. Our next pair of travel toys (not just travel mascots but also a travel couple) have connections at Marriott. 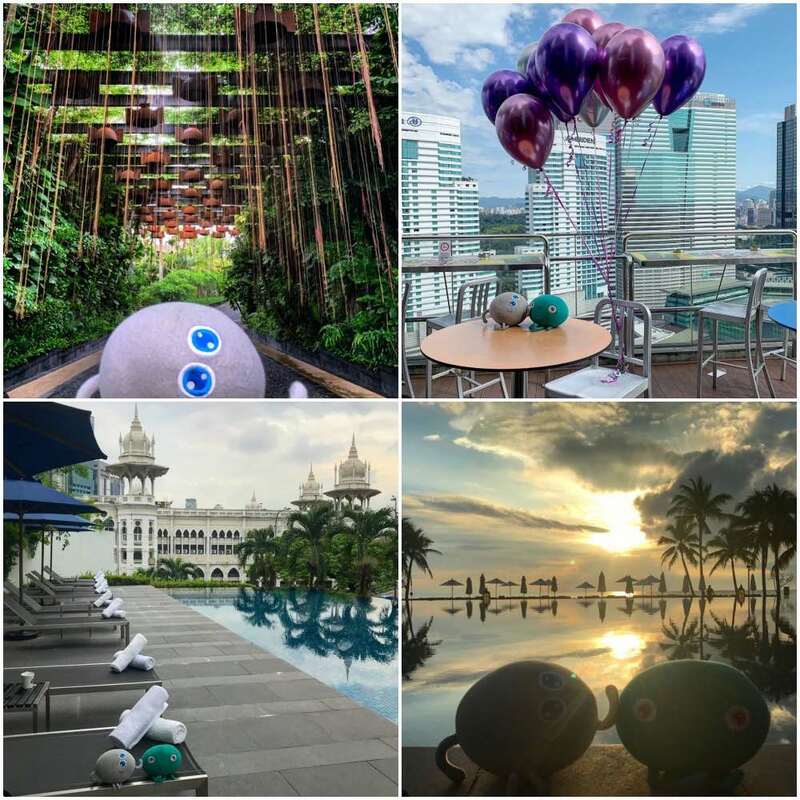 Current city: We are currently in Kuala Lumpur but on Instagram we are still posting trips on Bali. Future travel plans: Our plans that are planned out this year includes Ho Chi Min, Langkawi island, Samui island, and Jakarta. Some trips we do are spontaneous too. So we shall see how it goes. Favourite place: We love Bali the most, we go back every year to this magnificent island. Phuket is another island that we go every year. The experience each time never let us down in terms of the vacation vibe, the mood, the food, the weather, the sunrise and sunsets! Daddy got us as plush toy presents for his birthday in 2015 by Aloft Kuala Lumpur. Since then daddy has been bringing us along to all his travels around the world. They usually travel and stay at then SPG properties but now that Marriott has bought over SPG, we usually stay at Marriott brands of hotels and resorts. 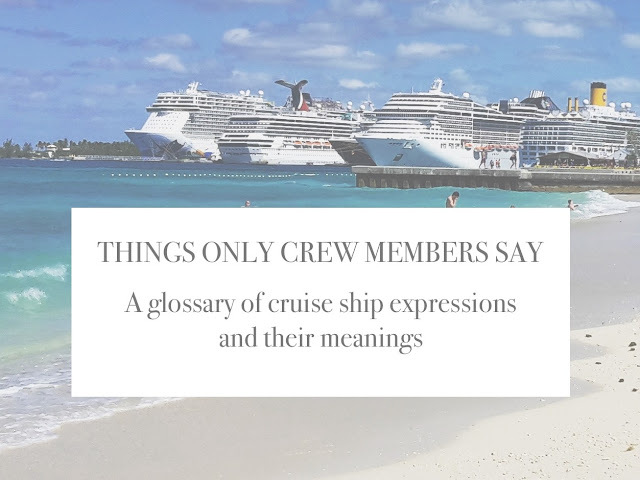 They’re not the only travel toys that travel in groups. There are 31 of these guys. I’m assuming they don’t all travel with their human every time (extra luggage is expensive), so I’m not really sure how they choose who gets to go? Maybe they’ve figured out how to play rock, paper, scissors with their paws? Future travel plans: Next stop will be Dublin & Hong Kong. Favourite place: We really don’t have a favorite though we especially love visiting the UK/EU for the history & architecture! Number of countries you’ve visited? It will take some time to count the cities we’ve visited so bare with us. 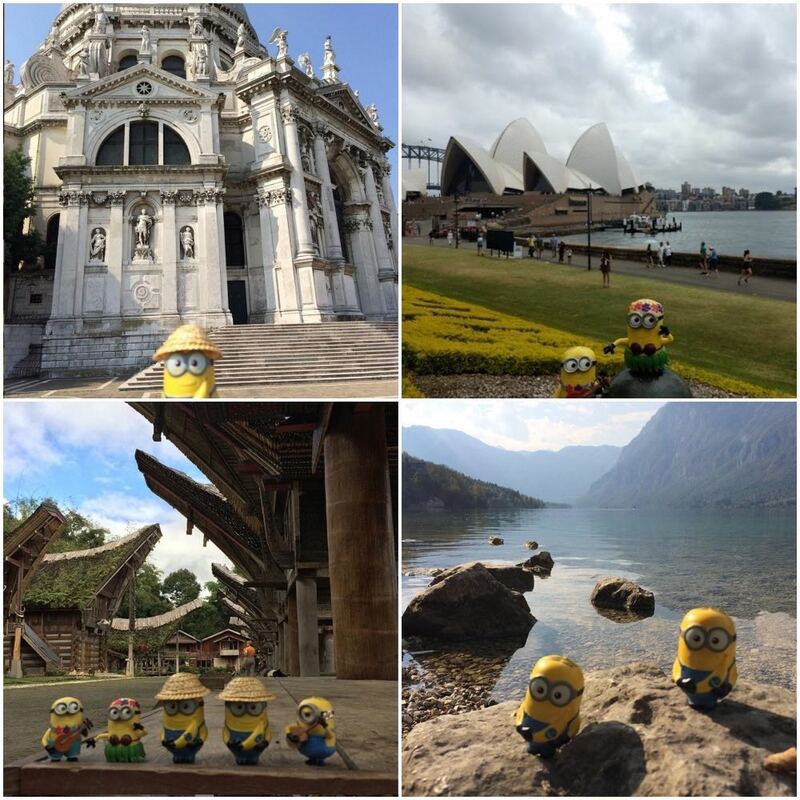 As per our IG we have visited 29 countries but there are probably a few more! We are made in Japan & our human bought the first of 32 bears 7 years ago (from Dubai) They have been collecting us for the past 4 years! Always from the same brand (craftholic) and mostly from stores in Bangkok, Hong Kong & Japan. 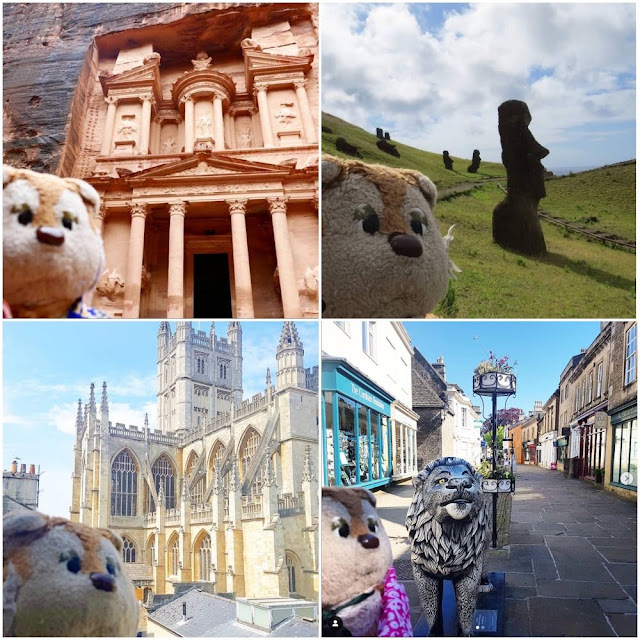 Our human had decided to start taking a couple of us on his journeys (different ones each time to be fair) and had accumulated so many interesting pics that he decided to start using them on IG, mostly for fun. We are their travel companions ready with a hug & smile keeping our humans happy. Current city: Currently two of us, Kevin and Stuart are in Peru, travelling from Titicaca to Cusco. Future travel plans: Next trip, Milivoj goes to Bath, to feel summertime in England. Then back to Italy, Venice, where we have a lot of Cats friends or Rome. 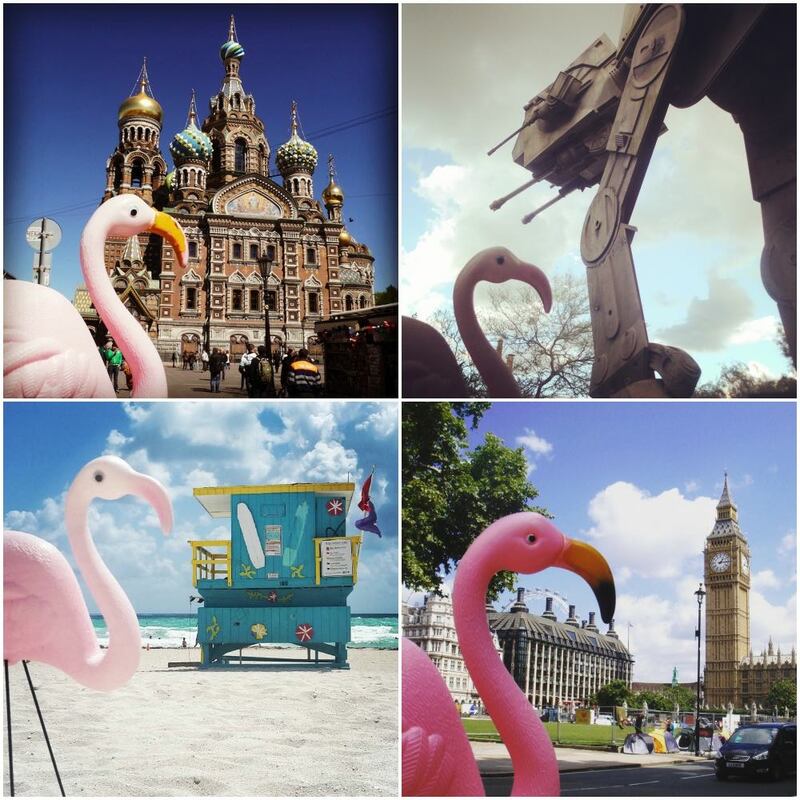 Favourite place: Our favourite places so far are Havana, Venice and Bali. Number of countries you’ve visited? We are weak in numbers. 20, maybe 30. We worked in marketing selling Chiquita bananas in one supermarket in Zagreb when we stroke a deal with some strange guy, left our jobs and the rest is history. Actually, we are taking this guy and his girlfriend on our trips, not vice versa. Being Minions we need help with taking photos, carrying cameras and bananas, and doing all the hard work. And paying for the whole business after all. Or before. Current city: Right now I am home in Berlin. Future travel plans: Next? I don't know yet. Often I travel spontaneously. I may join friends on a trip to Istanbul soon. But that's not confirmed yet. Favourite place: Pheeew, that's the toughest one. I like countries that are different from what I see in my daily life. Being based in Berlin, I still find it nice to travel to Paris, London or Brussels, but I wouldn't really call that exciting anymore. Exotic places like India, Myanmar or African countries are definitely more interesting. But not always beautiful, yet sometimes even overwhelming. Not only in a positive way. It's amazing how China changed within the last 20 years (I've been told by my human), I love the Australian way of life, I fell in love with the scenic landscapes off the beaten paths in Laos. To make a long story short: I can't decide. Oh, and coming back home, isn't bad either. I started traveling in December 2012. That's when I left a Toys 'R' Us store in Ft. Myers, Florida. Along with my twin brother, who may replace me should I ever happen to get lost in one of my many adventures. Standing on high rocks, rafting on a river or sitting on the parapets of bridges can be quite dangerous, even though I am usually secured with a wire. But you never know. My human loves photography and traveling, but he got tired of taking selfies wherever he went. So I had to replace him. 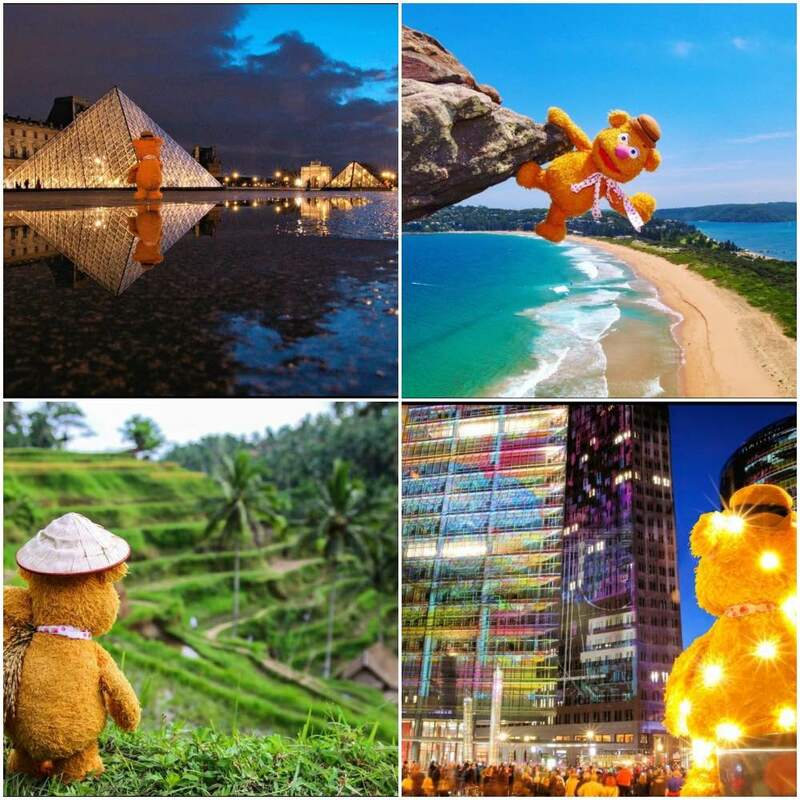 The idea is to capture famous places and beautiful sceneries in high quailty pictures. I am just an addition to make those pictures stand out from the usual tourist shot. I guess I was chosen on purpose because as a bear I can stand, sit, lie, move my hands and legs and sometimes even pose. Maybe I shouldn't reveil that I was cut open and had a wire skeleton implanted. Before I was just a soft plush toy. I was chosen as a muppet because I make a reference to another plush traveler who was quite famous when I started. 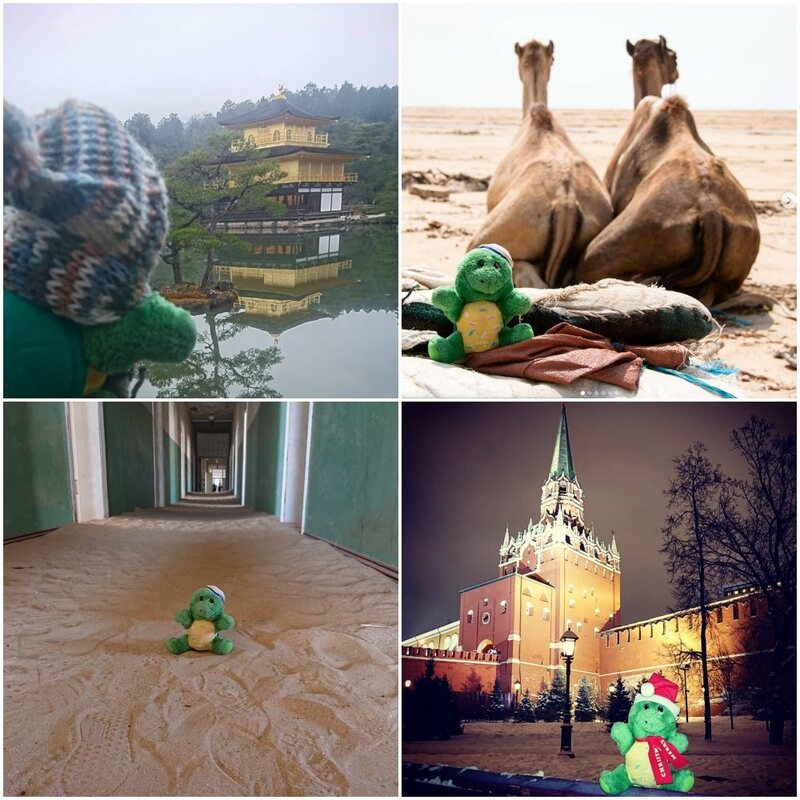 http://kermit-on-tour.com/ is no longer active by now, but the great pictures are still inspiring. Not the most Insta-famous but definitely the most well-travelled, is this solitary little guy. 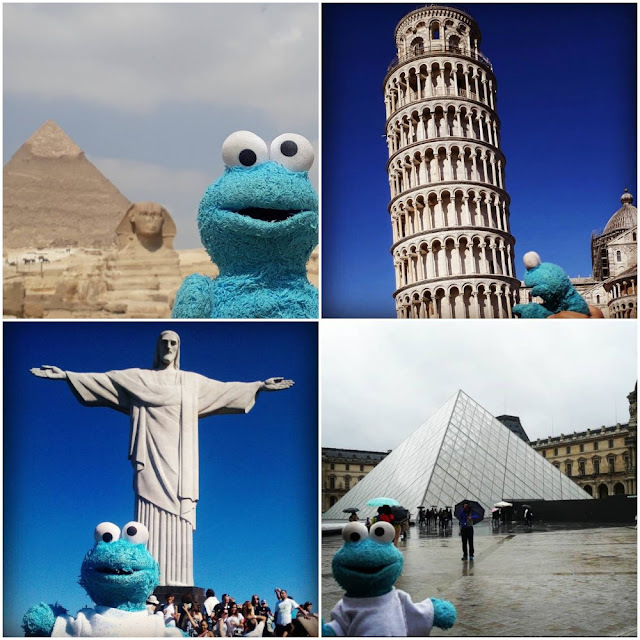 He’s been to over 400 destinations. Oh, the perks of being able to fit into a carry-on! Future travel plans: Travelling in Germany and planning to go Thailand, Japan and a few other countries! 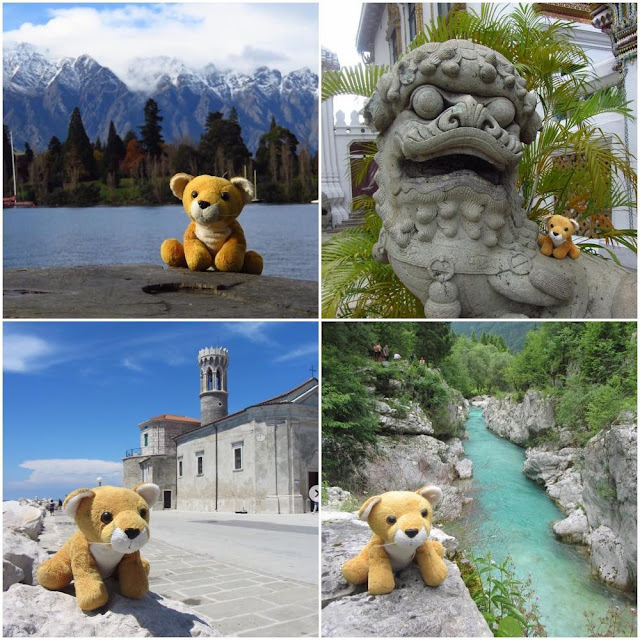 Favourite place: It's difficult to name one favourite place after visiting over 400 destinations... but Göreme (Turkey), Bled (Slovenia) and Kaikoura (New Zealand) come to mind first! Number of countries you’ve visited? So far I visited 46 countries, but by the end of the year I hope to make it 48. Where did your human get you and how long have you been travelling together? My humans found me in a discount bin in a small city in the Netherlands. I was purchased as a prop for a feature film my human was directing. 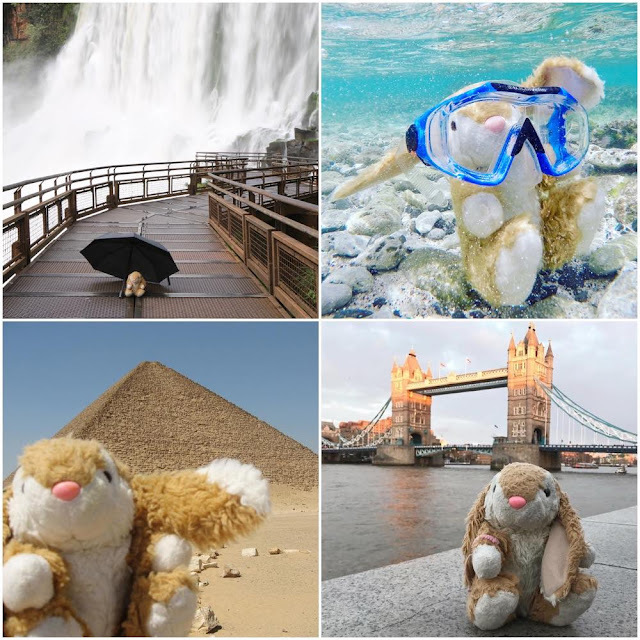 After the film I spent two years on a shelf my human decided I had the perfect size to become his travel partner on a 11-country EuroTrip! Since then we, together with my human's human, travelled and lived all over the world. Future travel plans: My human is trying to book flights to Mexico and hopefully some other places too. Favourite place: My human loves Miami and Havana, but then she also loves anywhere that has beautiful beaches or magnificent cathedrals. (That’s a lot of places!) I don’t have feelings, I’m plastic. Where did your human get you and how long have you been travelling together? A Target for $2.50, nine years. 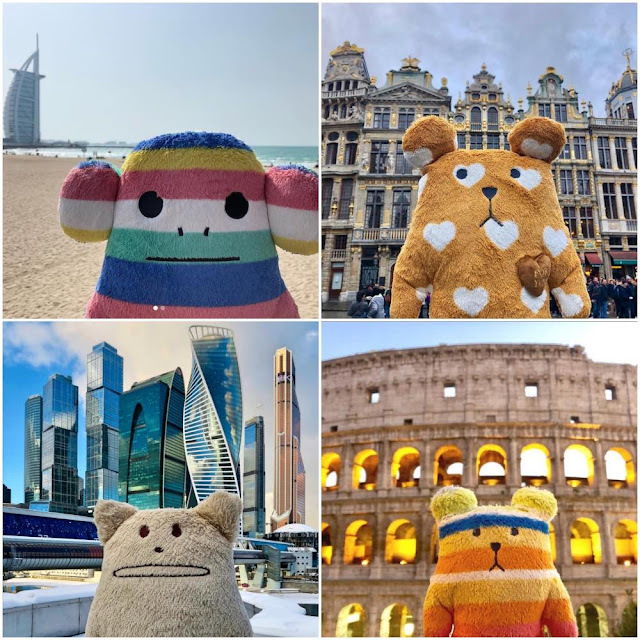 If you have a travel mascot tell us about it in the comment section below? 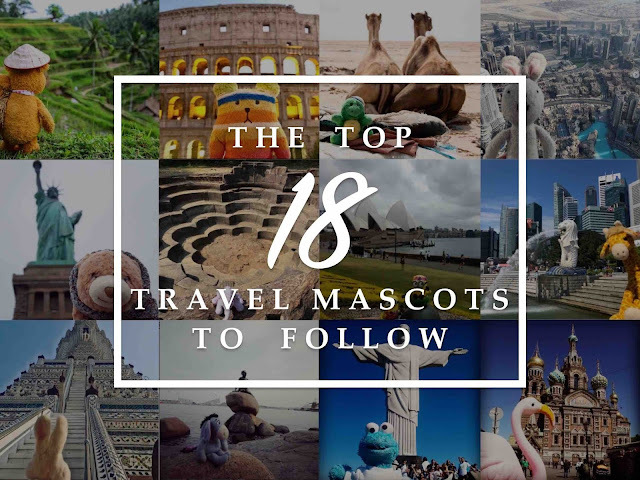 Or if you can think of any travel toy accounts that should be included in this list, tell us about them too?